Technological innovations are quickly shifting the balance between activities performed by humans and tasks performed by machines. Indeed, recent research by Frey and Osborne (2017) suggests that nearly 50% of all jobs in the US face a high risk of being automated in the foreseeable future. In developing countries the risk of automation may be even higher, with up to 70% of jobs at risk (World Bank 2016, Nedelkoska and Quintini 2018). The percentage of jobs that are at risk of robotisation and automation may be particularly high in manufacturing. In this column, we highlight the core findings on automation and robotisation from the EBRD’s Transition Report 2018-2019 (EBRD 2018). The number of industrial robots is on the rise around the world (Figure 1), both in absolute terms and as a percentage of the number of workers employed. Indeed, the total global stock of industrial robots is projected to increase by 14% a year, reaching 3 million next year. The number of industrial robots in use in the transition region stood at 41,000 in 2016, up from 1,500 in 1993 (based on data available for 22 transition countries). The vast majority of robots are deployed in manufacturing (particularly in the automotive sectors), but increasingly they are also being used in the production of plastic, chemicals, and metals. Source: International Federation of Robotics (IFR) and EBRD (2018). The extent to which robots are used in manufacturing varies greatly from country to country (Figure 2). The levels in the Slovak Republic and Slovenia (where there are more than 93 robots for every 10,000 manufacturing workers) are comparable to those in advanced economies and higher than those in Brazil, China, India, and South Africa. Hungary, Poland, Turkey, and Romania have also seen rapid increases in the ratio of robots to manufacturing workers. In contrast, countries such as Moldova, Morocco, and Serbia still have fewer than two robots for every 10,000 workers. Source: IFR, ILO, and EBRD (2018). Note: Data relate to 2016. 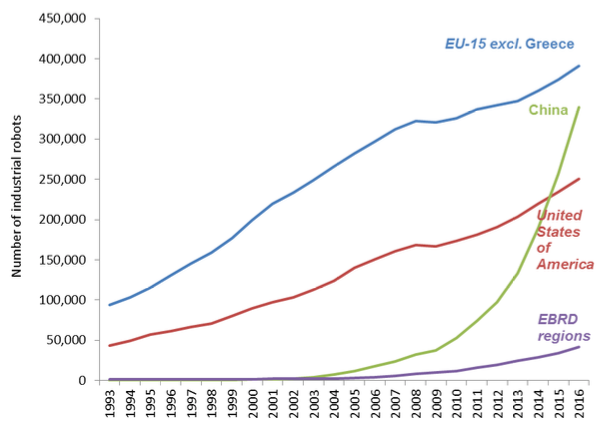 Source: Eurostat, IFR, and EBRD (2018). Note: Based on regression analysis for individual demographic groups. Lines correspond to the 95% confidence intervals associated with these estimates. To what extent has robotisation affected employment across emerging Europe? Two distinct channels may be at play. First, robots may directly replace workers. Second, firms that experience increases in productivity due to automation may also increase their demand for labour where it is complementary to the use of robots. In the 11 transition economies included in our analysis, we estimate that every additional robot per 1,000 workers has reduced the employment rate by about 0.7 percentage point. This suggests that robotisation can explain only 13% of the total decline in the employment rate observed in these countries between 2010 and 2016. There are no statistically significant differences between men and women or between younger and older workers in terms of the impact of robotisation. 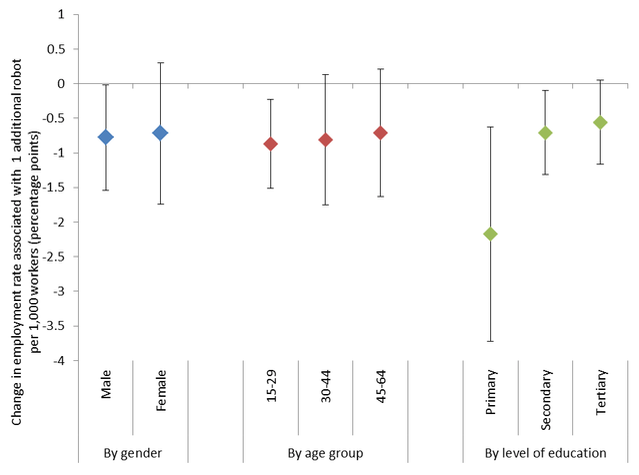 However, and perhaps not surprisingly, the impact of exposure to robots is as yet the strongest for people with relatively low levels of education (Figure 3). This may, however, change as technology evolves. 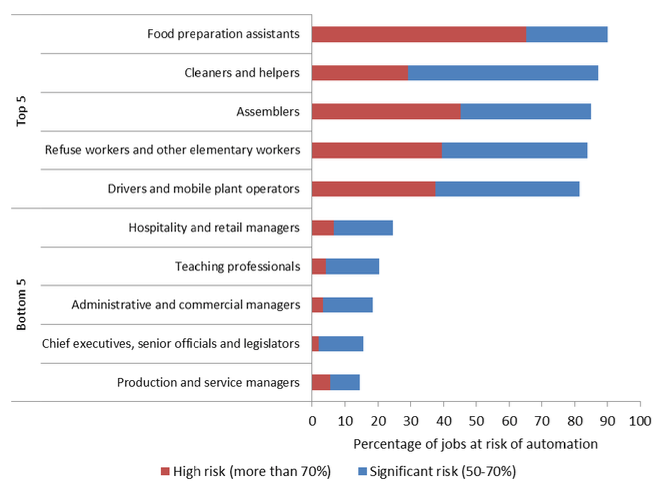 In the transition region, occupations such as food preparation assistants, cleaners and helpers, assemblers, refuse workers, drivers, and mobile plant operators face the highest risk of automation (Figure 4). Occupations that require significant analytical skills and/or high levels of social interaction (such as managers, professionals, and senior officials) are among those whose jobs are least likely to be automated. Industry-level analysis also suggests that automation is expected to affect primary-sector jobs most and services least. Source: Nedelkoska and Quintini (2018) and EBRD (2018). Note: Based on two-digit ISCO-08 classification. Jobs are at high risk of automation if at least 70 per cent of the tasks involved are at risk of being automated. Jobs are at significant risk of automation if between 50 and 70 per cent of tasks are at risk of being automated. Estimates are simple averages across Cyprus, Estonia, Greece, Lithuania, Poland, the Slovak Republic, Slovenia and Turkey. Occupations with fewer than 10 observations in four countries or more have been excluded. The rise of automation is therefore likely to result in substantial changes and shifts in labour markets across the transition countries in emerging Europe. Governments should be prepared to guide this process as much as possible, including through providing effective and well-incentivised social safety nets; encouraging re-schooling and life-long learning; and helping workers to upgrade their ICT skills. Authors’ note: This column has only scratched the surface of the findings from the EBRD’s 2018-19 Transition Report, available here. EBRD (2018), Work in Transition, Transition Report 2018-2019. Frey, C B and M A Osborne (2017), “The future of employment: How susceptible are jobs to computerisation?”, Technological Forecasting and Social Change 114: 254-280. Nedelkoska, L and G Quintini (2018), “Automation, skills use and training”, OECD Social, Employment and Migration Working Paper No. 202. World Bank (2016), World Development Report 2016: Digital Dividends, Washington, DC.